Sifnos: one of the best Greek islands, concerning food, drink, picturesque villages and summertime romance. The island of Nikolaos Tselementes, the most famous Greek chef and cookery book writer of all times, will amaze you with its diversity in activities and its unique atmosphere! Sifnos is connected to Athens throughout the year via the ports of Piraeus and Lavrion. The island is located about 130 km from Piraeus and the ferry trip from there lasts around 5:30 hours, while from Lavrion the trip lasts more than 8 hours. The tickets of the conventional ferries are relatively cheap. The high-speed ferries that serve this route during the summer cover the distance in 2-3 hours and are usually a bit more expensive as well. Sifnos is also well connected to Serifos, Kythnos, Milos and Kimolos with regular and highspeed ferries (during high season). 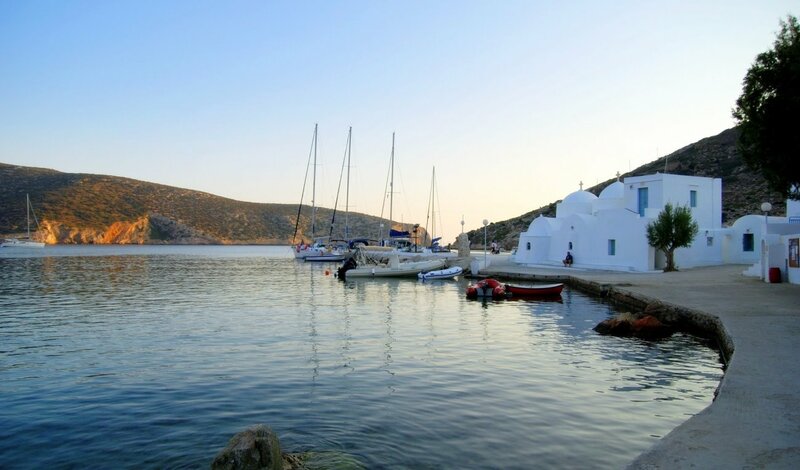 Especially during August, there are more than three boats reaching Kamares -the main port of Sifnos- daily. Moreover, during summer there are some ferries per week that connect Sifnos to other Cycladic islands, such as Folegandros, Naxos, Koufonisia and Amorgos. Sifnos is an island of great history! Inhabited by humans from ancient times the island offers to the visitor, apart from the breathtaking views, a great variety of villages, churches and cultural spots. The road network is not the best, but it is worth going a little “off road” to explore the secrets of the island. There are many villages, like Artemonas, Kastro and Apollonia, with the latter being the island capital (or Chora). Kastro was the ancient center and it is worth going there for brunch, morning coffee or for an afternoon aperitivo! You should definitely walk around and explore the old city between the ruins of the fortress and gaze the breathtaking view to the Aegean. A visit to Artemonas will give you the feeling of summer serenity and a walk there, combined with traditional food tasting will give you the feeling of paradise. Apollonia is for the night, or the night is for Apollonia. Every night the whole island comes to Apollonia to visit “Steno”, the small sidewalk with souvenir shops, art galleries, restaurants and bars being alive until the early morning hours. It is not a coincidence that Apollonia got its name from Apollonas, the God of music and light, according to the Greek mythology. Sifnos has many beautiful beaches that are spread across the island coast line and offer different options for different tastes but above all, clear waters and magnificent views to the Aegean! Sifnos is a medium sized island with various possibilities of activities for its visitors. Starting from the preferred choice of everyone during the summer: swimming! If you like walking, there is a rich hiking network of paths around the island. These paths can lead you to beautiful sunsets in Kamares beach or Chrysopigi church and if you are a real explorer you can reach the north part of the island, Cheronisos and admire the endless sea! Although it is hard not to notice when there, you might want to know that Sifnos has 360 churches, which means that there are many religious festivals (panigiria) throughout the summer, especially during August. Going to a Greek religious festival is always a good idea, if you want to meet people, listen to traditional music and dance folklore tunes, taste the unbelievable food and try the best wine. Island hopping around Sifnos is the best idea! With Serifos being only 20 to 50 minutes away and the ticket cost being under 10 euros, you can enjoy your holidays to both islands! Check out our Ferry Map, find all the ferry connections to Sifnos and start planning your island-hopping in the Aegean straight away!